This page keeps an up to date list of all the questions that have been asked during the entire procurement process and their respective answers. For transparency reasons, all the questions should be addressed via the form below and will be answered for the benefit of all potential suppliers. Please note that the answers provided are only meant as a guidance for interested parties, to allow for a common understanding by all potential suppliers. They are not legally binding in any way. The only binding documentation will be the Call for tender documentation to be published. Consent for your question Consent for your question I consent for my question (not the e-mail) to be published online on the page "Q&A Section" on this website! R&D procurement concerns a purchase of R&D by a body governed by public law. In this context, R&D (Research and Development) concerns the phase before commercialization in a product development cycle. R&D can cover activities such as solution exploration and design, prototyping, up to the original development of a limited volume of first products or services in the form of a test series. “Original development of a first product or service may include limited production or supply in order to incorporate the results of field testing and to demonstrate that the product or service is suitable for production or supply in quantity to acceptable quality standards”. R&D does not include commercial development activities such as quantity production, supply to establish commercial viability or to recover R&D costs, integration, customization, incremental adaptations and improvements to existing products or processes. According to the terminology used in the public procurement Directives, a public procurer can choose between three types of procurement contracts depending on what is the objective of the procurement. The objective of public works contracts is to procure the execution of works, public supply contracts to procure the supply of products, and public service contracts to procure the provision of services. In this context, a ‘work’ means the outcome of building or civil engineering works taken as a whole which is sufficient of itself to fulfil an economic or technical function. ‘Public supply contracts’ cover the purchase, lease, rental or hire purchase, with or without option to buy, of products. ‘Public service contracts’ are public contracts other than public works or supply contracts having as their object the provision of services. A public contract having as its object both products and services within the meaning of Annex II of the Directives shall be considered to be a ‘public service contract’ if the value of the services in question exceeds that of the products covered by the contract. Also, for R&D, there is the possibility of a R&D works, R&D supplies or R&D services contract. This depends on whether the main objective of the contract for the procurer is to get R&D works performed (e.g. purchase of the construction of an R&D test site), R&D products to be supplied (e.g. purchase of the outcome of an R&D activity: e.g. acquisition of a prototype, hire of a beta/test version of a product) or an R&D service to be performed (e.g. purchase of a number of man-hours of researchers’ and/or developers’ services to perform R&D activities according to the procurer’s specifications). PCP is one particular approach of procuring R&D “services” (it is not an R&D supply or works contract) in which risk benefit sharing at market conditions is applied. PCP enables public procurers to share the risks and benefits of undertaking new developments with the companies participating in the PCP in a way that does not involve State aid. What makes PCP interesting for public procurers? What are the potential benefits of PCP for industry? In pre-commercial procurement public authorities challenge industry to develop solutions for public sector problems that are so forward-looking and so technologically demanding that either no commercially stable solution exists yet on the market, or existing solutions exhibit shortcomings which require new R&D. By triggering the development of breakthrough solutions ahead of the rest of the world market, public authorities can through their role of demanding first buyer create opportunities for companies in Europe to take international leadership in new markets. The virtuous process of co-evolution of demand and supply enabled by pre-commercial procurement shortens the time-to-market for the suppliers that can better anticipate demand for new solutions and better align their product developments to fulfil concrete customer needs. Active involvement of interested public buyers from the early product development stages also enables public authorities to detect at an early stage potential policy and regulatory barriers that need to be removed in time to ensure short time to market for innovating public services. Assigning IPR ownership rights to companies participating in PCPs enables those companies to address wider markets beyond the procurer that initiated the development. Streamlining desired product specifications amongst suppliers and procurers at the stage when products are still under development empowers procurers to foster the necessary degree of standardization amongst suppliers to guarantee economies of scale and interoperability. Cooperation between procurers at the pre-commercial stage can act as a driving force to create the required critical mass on the demand side to reduce market fragmentation and increase economies of scale for suppliers in Europe. Through export focused commercialisation wide take-up and diffusion of the newly developed technologies can be achieved in different sectors, comprising private as well as public markets, locally and globally. What is the selection approach regarding which company(ies) continue in each phase? It is a competitive phased process. Suppliers work in parallel on their own solution. In other words, every supplier must answer all requirements successfully to proceed to the next phase. Details will be added after the finalization and publication of the Call of Tenders. Can partners be added, or consortium be changed between phases? Contractors that successfully completed Phase 1 and provided that their Phase 2 bid is selected (upon evaluation), will be awarded a Phase 2 contract. Contractors that successfully completed Phase 2 and provided that their Phase 3 bid is selected (upon evaluation), will be awarded a Phase 3 contract. It is a closed process, and no one can join in between phases, however, suppliers can add subcontracts in between phase according to the conditions set by the Call for Tenders. Details will be included in the published of the Call of Tenders. How could a PCP process be initiated and how could the relevant and interested stakeholders be involved? From the demand side, innovation procurement starts with an “unmet need” for innovative solutions, which is “a requirement or set of requirements that you (public procurers) have now or (preferably) one that you will have in the future, that current products, services or arrangements cannot meet, or can only do so at excessive cost or with unacceptable risk”. Once Phase 3 is finished, will another open call be opened for the Commercial Phase? The first step is to form a critical mass of purchasing power on the demand side (one large enough buyer or several smaller buyers in a buyer’s group). One that can incentivize industry to scale up the production to bring solutions to the market with the price and quality requirements for large scale deployment. What is the SHUTTLE project? What is Joint Procurement? Who participates in the SHUTTLE Joint Procurement? As per definition provided by EU, a Joint procurement combines the procurement actions of two or more contracting authorities. In this regard, the PCP Framework Agreement and Phase contracts will be awarded as one single joint procurement by the beneficiaries concerned. The group of procurers and the the buyer’s group have appointed a lead procurer to coordinate and lead the joint procurement. The lead procurer will act as Contracting Authority, publish the PCP call for tender in the name and on behalf of the buyer’s group under the Greek applicable legal framework for public procurement coordinate the joint evaluation of offers. For other tasks related to the preparation of the call for tender, evaluation of offers, monitoring of the suppliers, validation/testing of solutions, evaluation of the results/impact of the call for tender, the effort to carry out these tasks can be shared between the members of the buyers group and the lead procurer (and where relevant by others such as end-users e.g. to test solutions, external experts e.g. to evaluate offers etc). Lead Procurer is KENTRO MELETON ASFALEIAS (KEMEA). 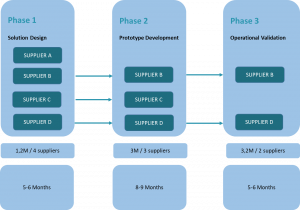 How is the Procurement process organized? How long would the overall Procurement Process take? SHUTTLE approach adopts the basic concepts of the Pre-Commercial Procurement (PCP) as proposed by the European Commission, is outlined in the following figure also incorporating the approximate duration of each phase. What is the Open Market Consultation? build trust between potential buyers and providers by explaining the procurement need, the envisaged contracting setup to vendors and evaluating their feedback in order to fine-tune the tender specifications that will drive to prototypes and pre-operational solutions. When do you plan to launch the call for tender? We currently plan to launch the call for tender around the end of May 2019 or early June 2019. Where can I find partners to form a consortium? On the 30th and 31th of January 2019 during the Open Market Consultation event, a networking event was held, aiming to enhancing relationship between the participants. Will a UK company be able to participate in the SHUTTLE PCP? EU and EEA (European Economic Area) member states. H2020 Associated Countries having signed a Bilateral Agreement with the EU on security procedures for exchanging and protecting classified information. Groups of economic operators of the above natural persons or legal entities, submitting a joint tender. Based on the above, the eligibility of UK companies will depend on their actual status at the time of submission of tenders. What are the IPR conditions in SHUTTLE? SHUTTLE proposes an IPR (Intellectual Property Rights) approach, which is fully aligned with the fundamentals of PCP. SHUTTLE procures R&D services at market price, thus providing contractors with a transparent, competitive and reliable source of financing for the early stages of their research and development. The partners will set up the suitable mechanisms that will allow sharing risks and benefits between the Contracting Authority and the PCP contractors. The ownership of the IPRs generated by a supplier during the contract will be assigned to that supplier. Giving each contractor the ownership of the IPRs attached to the results it generates during the PCP means that they can widely exploit the newly developed solutions commercially. All the Consortium members will be assigned a worldwide free and non-exclusive license to use the R&D results for internal use. In return, the tendered price (market price) must contain a financial compensation for keeping the IPR ownership compared to the case where the IPRs would be transferred to the procurers. Moreover, the contractors can be requested to offer license to third parties under fair and reasonable conditions with respect to the rights of third parties that do not accrue to the contractors. It will be ensured that if the IPR rights are not exploited within 4 years after the finalization of the Framework Agreement, they will return through a call back provision to the Consortium members. Details will be included in the published Call of Tenders. What is the overall subcontracting budget? The total amount dedicated for all phases of the procurement process is 5.9 million excluding VAT. How will the solutions be validated in Phase 3? The participating contractors successfully completing Phase 2 and continuing in Phase 3 will develop the final version of the Toolkit. In Phase 3 will be conducted experimentation of the prototypes in real environment of the Forensic Labs using relevant operational benchmark cases and samples. It will be validated if the Toolkit results to be an effective Solution for the End-user from an operational perspective. In this regard, operational scenarios will be developed with specific areas and measurements of testing. Details will be added and included in the published Call of Tenders.